After the last month, I now feel qualified to write about how to choose a paint color for any room. At first it may seem like a very easy decision. You look at the room and think….blue! You can picture the room with blue walls, visualize it perfectly in your mind. But the more you think about it, the more you think yellow might brighten up the room and add a cheery atmosphere. Too much pressure!!!!! This is the exact situation that I found myself in last month when we decided to take the plunge and paint the dining room, living room and hallway. I was so set on a nice steel blue that I almost started buying accessories. But this nagging vision of yellow kept popping into my mind. Yellow is NOT my color at all. I don’t like yellow flowers, yellow cloths, yellow fruit, etc. 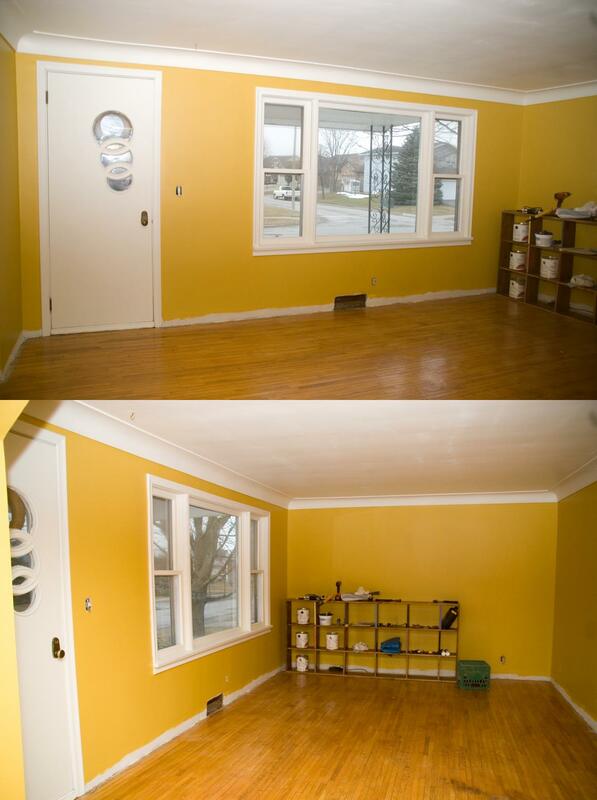 But for some reason, some part of me wanted to paint half of my house yellow. But I love blue and the soft, calming effect it can have!! Too much pressure!!! Here is how I finally made the decision. I used logical questions that helped me finally make a decision! 1. Ask social media. This may seem silly, but people may come up with other logical reasons that you may not think of. I posted this picture of our dining room which was photoshopped in both blue and yellow. I also added a carpet to give it a warmer feel. The response was insane! Some of my online friends brought up some really good points like yellow is nicer in the daytime and blue is better at night. So when you would be using these rooms would make a difference. Another friend mentioned that yellow and the hardwood color choice (which is also photoshopped….that is another project) create a very warm and comfortable feel. They gave me things to think about that I may not have. Someone even brought to my attention that yellow causes jealousy in people while another mentioned that finding the right shade of blue could be very hard because it all depends on the lighting in each room. No one wants to end up with a baby blue dining room! In the end, blue was the choice color by over 100 people. 2. What will you be using the room(s) for? This makes a big difference. Painting your bedroom neon green may not work, but it may look nice in a kitchen or a mudroom (depending on your decor style of course!!). Bedrooms and dining rooms are used in the evening and tend to look better with warm, neutral colors such as beige, blues, browns etc. Bathrooms and kitchens are used all the time at all times of the day and tend to need more energy like yellows, greens and bright colors. Living rooms are a personal preference and depend on what you use them for. Do you host often using the living room? 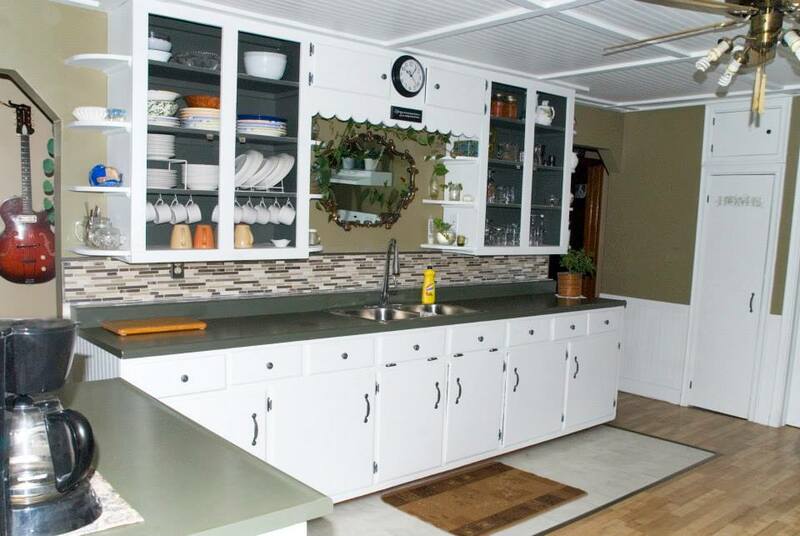 This is our kitchen when it was ALMOST complete. We picked a sage green with LOTS of white! I know at our house, everyone congregates in our kitchen, not our living room, so we made sure it was bright and full of energy. Think about what you will be using the room for and what kind of energy you want to create. It is amazing how a color can change a room and you want to make sure that it says exactly what you want it to say when you enter the room! 3. How much work are you willing to put in? Here is a fact that I learned when I painted a room orange. It takes a MILLION coats. Orange, red and yellow take the most coats. It doesn’t matter what color you are painting over, it will take a very minimum of three coats, even over primer. Keep this in mind when you pick your color. These colors also show a lot of imperfections. So if you are not the best drywaller, maybe steer away from these colors, unless of course, you have a lot of pictures to put up! 4. Lighting is so important! When we were making the color decision for our living room, dining room and hallway, I took a bunch of color choices in blue and yellow and taped them to the walls in different rooms and mo ved them for different lighting throughout the day. Some colors changed so much, that they look completely different (and not always what you want). Watching the colors change throughout the day was a very interesting experimnet and I suggest you try it! You will be amazed. 5. Think about your furniture. The last thing you need after spending time and money on painting a room is to have to go out and buy all new furniture to go in the room because what you have doesn’t match your new color. This was almost a huge mistake for me. While leaning towards blue for our rooms (just because I liked the color) it would not have matched our furniture pr area rugs very well and I would have been tempted to go buy a new couch set. Remember what you will be putting in the room and make sure that the colors jive, including any accent colors you have or plan to add. 6. Flooring and trim, do they work with the color? When we started our project, all of the trim and floors were stained a 1950’s orange. Yuck! I wanted to paint all of the trim and baseboards white, while finishing the floor in a semi-transparent dark walnut. This is where I changed my mind and made the final decision to go yellow! With the blue, the white baseboard and dark floors did not work so well with the blue. The yellow just worked it all together!! The new yellow living room before the flooring is done and baseboards put up! 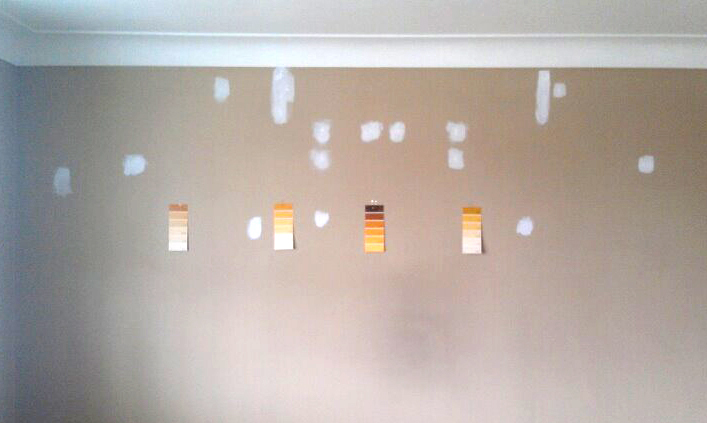 So there you have it, some things to think about when deciding to paint your walls. 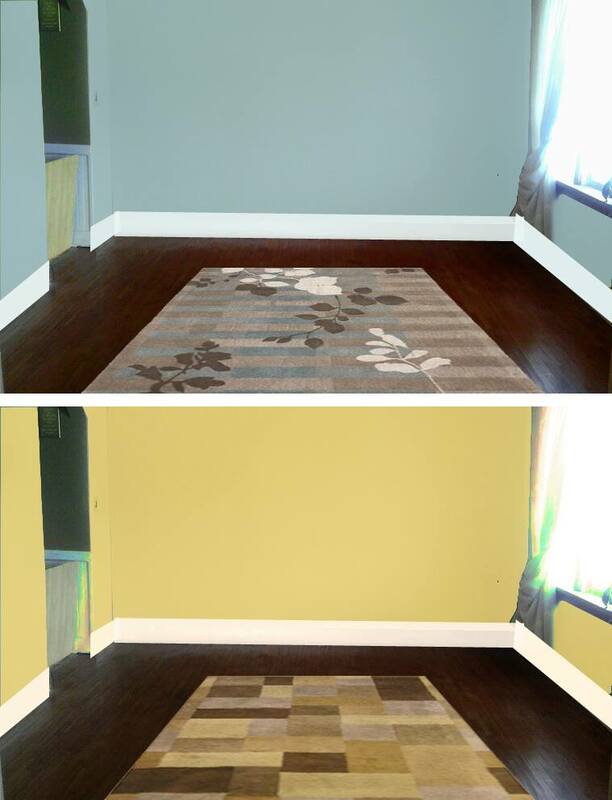 At the beginning it is a cheap and fun way to change a room completely. But if you choose the wrong color, you might find yourself spending a lot more money on accessories and furniture, or painting it all over again. Put some thought into it and make sure it will bring out the very best in your room!! We ended up choosing a color called “Cairo Gold”. It is bright and uplifting in the mornings and in the evenings it is soft and calm and inviting. I am excited to start the next chapter, the hardwood floors!! !